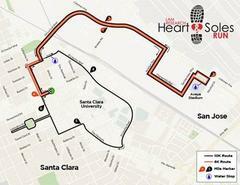 The Silicon Valley Leadership Group Foundation produces three annual races for local charities and organizations – Applied Material Silicon Valley Turkey Trot, TiVo Santa Run Silicon Valley and Lam Research Heart and Soles. A detour route available via Lafayette St, Reed St, Martin St, and Brokaw Rd. • Future traffic advisories can be obtained by subscribing to eNotify and/or Nixle. For media inquiries, please call Lieutenant Todd Cummins at 408-615-4865.